Catherine Basquil 17 Nov 1845 Resided. A poor Small Landholder, does not reside. Gone to beg through the Country. I can’t find the entry for the original loan to Catherine, in the Irish Poverty Relief Loan registers. It had to have predated this entry, though, so sometime in the early 1840s. To put this in context, 1845 was the start of the great famine. But that came after several years of economic distress and poverty in the west of the country, and Mayo was hit quite hard. Catherine would have likely been in dire straights before the famine even began. When the potato crop failed in the autumn of 1845, Catherine, like millions of other Irish folks, would have lost their last hope of a reprieve. Things had to have been terrible if taking to the countryside to beg was your Plan B. There were numerous reports in contemporary newspapers of people dropping dead of starvation in or alongside the roads. Many of them, like Catherine, were subsisting through begging, their benefactors generally not much better off than beggars themselves. SLIGO.–The misery which the people are now enduring “beggars all description.” From all quarters we hear the most lamentable accounts. Persons who were last year enjoying comparative health–who had, at least, the means of keeping the wolf from the door, are now reduced to the lowest ebb of want and destitution. The shopkeepers and men in business are doing literally nothing, while pauperism is fearfully on the increase. In Kilturra the great majority of the inhabitants are at this instant living solely upon turnips, and the supply of this watery, unsubstantial food, will soon be exhausted. What will then become of the poor? Already–within the last week–three human creatures have died, or rather perished, for want of food, in Kilturra.–Sligo Champion. SUICIDE FROM DESTITUTION.–A man, whose name we could not ascertain, committed suicide by hanging himself in the neighborhood of Ardnaglass, on Friday. A recommendation for out-door relief to the relieving office was found on his person.–Ibid. GALWAY.–We have been informed of a heartless case of extermination of six families off the property of Mrs. Lynch, of Windfield, at Lisgeavy. While these poor people were induced to go to the relieving officer of the district for relief, their miserable cabins were pulled down, and the work of destruction would have been greater, but for a member of this lady’s family who happened to come up, and warned them to desist. We trust so cruel a proceeding was carried on without the knowledge of Mrs. Lynch, and that some reparation will be made to these unfortunate people.–Tuam Herald. 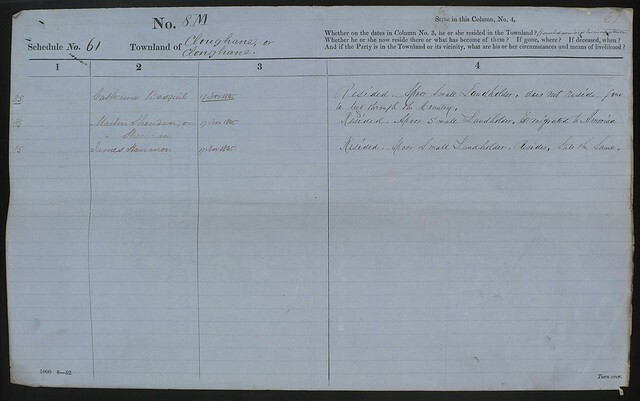 DEATHS BY STARVATION.–A correspondent of the Limerick Chronicle, writing from Tulla, in the county of Clare, states that an inqust had just been held on the bodies of one man and two women, named Boland, who had died of starvation. Five or six weeks before their death, everything they possessed had been seized for rates, since which time they had never lain on a bed. The Bolands held over twenty acres of ground corn from Colonel Windham. MORE DEATHS FROM STARVATION.–Thomas Denehy, Esq., coroner, has been busily employed during the past week holding inquests on the sad remains of victims to the now indeed prevailing famine. On Wednesday he held an inquest at Ballysaggartmore, on Patk. Murphy, an unfortunate man who had to be turned out of the union workhouse for insubordination, $c., and was found dead on the mountain. Verdict–Patrick Murphy died on the 1st February at Ballysaggartmore, from the effects of hunger and want. On Monday, Mr. Dennehy held another inquest at Templemichael, near Youghal, on a poor woman, when a similar verdict was returned; and on the 3d instant, another at Lismore, on a woman who had obtained lodging from a farmer near that town, and who was found dead the next morning. Verdict–Died of want and hunger on the 2d February, 1848. This is the fifth death from starvation in that lonely and picturesque locality within the last few days.–Waterford Mail. APPALLING STATEMENT.–Bryan Sloan, Mary Sloan, and Ellen Stanton, died of starvation in Ballintubber this week. Their bodies are still unburied for want of coffins! There are three others in the same village whose deaths are hourly expected from hunger. The creatures were on the relief list, but being unable to attend the calling of the roll, as they lived som miles from the work, they were struck off, and were thus left a whole week without a morsel of food. Whole villages are already depopulated in Ballintubber. In one large townland every head of a family has been cut away by famine and fever but two men; and unless some step be taken to relieve the poor there, the entire parish will become an awful grave-yard. The overseers are Thomas Sheridan and Pat Dea, of Ballintubber and Ballyheane. While writing, three dead bodies, in one company, have passed our house for interment. STATE OF THE POOR–STARVATION.–We have been informed that within the last week upwards of twenty deaths have taken place from starvation. Mr. Bourke, coroner, held an inquest on Saturday last on the body of Patrick Stanton, of Drimulra (between this town and Newoport), who was found on the roadside, in an exhausted state from hunger. On the examination of several witnesses, who deposed that the deceased had been receiving the rations, but so inadequate was it for the support of himself and his family, that he had to beg from door to door; and on this particular day his family having consumed the last morsel, he made another effort to seek from his neighbours a bit of bread, but unfortunately his sufferings overcame him, and he sank, the victim of horrible hunger, by the roadside. A verdict of death from starvation was accordingly returned.–Mayo Constitution. THE SHROUDLESS AND COFFINLESS DEAD.–Withing the last week the remains of no less than five persons have been carried through this town, by their surviving friends, to the burying-ground, without shroud or coffin.–Ibid. PROGRESS OF DESTITUTION.–It is our painful duty to announce the wholesale murder of one hundred deaths this week in our poorhouse, gaols, and hospitals. In Connemara, in the neighborhood of Roundstone, FOUR, FIVE and SIX dead bodies have been for days over-ground, no persons being found to perform the sad rights of burial for them, and not until the dogs had destroyed the body of an old man, the flesh off the back was entirely taken away. Four persons have been committed to our county prison from that locality charged with stealing a filly which the poor creatures were found eating. We give this as food for the English press.–Galway Vindicator. INCREASE OF DESTITUTION.–It is now perfectly manifest that the poor-rates of this union will fall lamentably short, and be totally incapable of supporting its pauperism, which is daily augmenting. In our town destitution is wide-spread. It is overrun with strolling beggars. On Saturday evening a man named Corcoran came to the gate of the grave-yard of this town. He carried in his arms the body of a child, which was coffinless and shroudless, which had been dead for five days, and which, having gained admittance, he interred in the grave-yard without a coffin. He endeavoured to collect the price of a coffin–but all he was able to produce was eightpence, some of those from whom he begged being beggars, and others not believing his sad story to be true, in consequence of the many impostors who practice on the credulity and benevolence of the people; therefore, the unhappy man had to bury the remains of the child, who died from want, without a coffin.–Nenagh Guardian. An inquest was held near Dungarvan, on Thomas Terry, of Castle Quarter, and a verdict, died of starvation, returned. The unfortunate man took a turnip from a field, but got so weak that it fell from his hands, and rolled from his reach. A witness named Gleeson, a publican of Abbeyside, described his moans as awful, yet did not assist him.–Waterford Mail. A HORSE EATEN BY HUMAN BEINGS.–A very revolting case of distress occurred last week at the village of Sneem. Mrs. Moran, a pedlar from Killarney, had a horse of hers in same way while on her way from Iveragh, and on arriving at Sneem had it shot by one of the police, to put it out of pain. In a few hours after, the horse was skinned, the carcass cut into pieces by several of the poor people, taken away as food, and actually eaten. Of this fact there is no doubt, as I made it my duty to make inquiries about it. The persons who took the horse for food were persons holding small lots of ground, which they are unwilling to part with, being under the impression that, if they retain them, and make an exertion to set potatoes, the government will support them while doing so. The out-door relief is carried out a=in that district to a very great extent, and every exertion used by the landlord, James F. Bland, so far as his own property extends, assisted, I cannot deny, by the relieving officer, to afford relief to the most necessitous in that distressed district.–Tralee Chronicle.